Hunger of Cold Nights is an album with so many characteristics I admire that it's been hard to bring myself to the painful realization that it's only a hair above average in its impact. 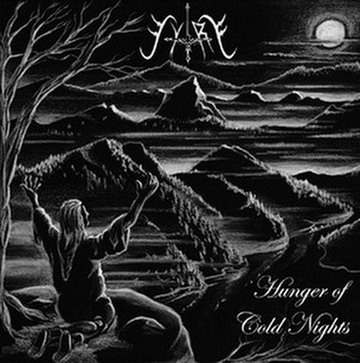 From the grim, hand drawn cover artwork all in shades of black and white, to the band's simple but memorable logo, the perfect packaging for newsprint toned black metal, eloquent if familiar lyrics, and an even-keeled, powerful, clear studio production that sounds fantastic bursting forth from my speakers. Sytry had all the ingredients here for a breakout underground black metal debut (or sophomore if you count the re-issue of the eponymous demo as an album), but it's hampered by the endless sameness of its composition style and for never truly embracing the sinister DNA from which its sprung. Seriously, this thing 'sounds' great, but utterly fails to produce anything but repetitive, unmemorable midlist black metal which is competently crafted in execution, but lacking imagination. Streaming, semi-melancholic riffs play out in predictable, cyclic patterns, with nary a chord progression that can stand out on its own anywhere. The drums are flawlessly beaten, but so many of the tracks thunder along at the exact same speeds that the beats become mechanistic and indistinct. There's a decent swell of bass to support the airier production of the guitars, but it doesn't carve out creepy enough lines of its own to really add the depth and atmosphere the album could use. Lastly, the vocalist has a fairly sincere snarl going on here, broadcast loudly enough to stand at the fore of the instruments without ever weakening or drowning them out, but his own syllabic patterns just aren't tortured or passionate enough to enhance the riffing beyond its standard state. Creativity was just not a virtue for Sytry here, but rather adding yet another album to the endless canon of early 21st century black metal bands aping their predecessors and peers. It's difficult to pinpoint the precise 'scene' where this Italian act fits in, because they don't particularly sound like their own countrymen, but more like a mashup of Swedish and Teutonic styles, or a kinship with the Greek bands that also went for a Scandinavian aesthetic to their writing, rather than the more regional, mid-paced melodic pacing. I'd liken them to some of Endstille's output, only they lack the ability to conjure up riffs nearly as hypnotic as those Germans, nor are they as violent. But they possess that same aim to throw those higher pitched chord-flows at you repeatedly. Hunger of Cold Nights is not an album I'll immediately boot from my collection, since I've got a soft spot for traditional black metal and really like how the thing looks, but it's just never one I'd reach for with so many proven options available to me. Recommended only to those most strict, non-picky adherents of the black metal genre who will appreciate anything with the right drums, vocals and guitar tone, but demand little more than that to sate their night-lust.